The digital book format originally used by Sony Corporation. It is a proprietary format, but some reader software for general-purpose computers, particularly under GNU/Linux (for example, Calibre’s internal viewer), have the capability to read it. The LRX file extension represents a DRM encrypted eBook. More recently, Sony has converted its books from BBeB to EPUB and is now issuing new titles in EPUB. CHM format is a proprietary format based on HTML. Multiple pages and embedded graphics are distributed along with metadata as a single compressed file. The indexing is both for keywords for full text search. The Digital Accessible Information SYstem (DAISY) is an XML-based open standard maintained by the DAISY Consortium for people with print disabilities. DAISY has wide international support with features for multimedia, navigation and synchronization. A subset of the DAISY format has been adopted by law in the United States as the National Instructional Material Accessibility Standard (NIMAS), and K-12 textbooks and instructional materials are now required to be provided to students with disabilities. DAISY is already aligned with the EPUB open standard, and is expected to fully converge with its forthcoming EPUB3 revision. DOC is a document file format that is directly supported by few ebook readers. Its advantages as an ebook format is that it can be easily converted to other ebook formats and it can be reflowed. It can be easily edited. The EPUB format has gained some popularity as a vendor-independent XML-based e-book format. The format can be read by the Kobo eReader, BlackBerry devices, Apple's iBooks app running on Macintosh computers and iOS devices, Google Books app running on Android and iOS devices, Barnes & Noble Nook, Amazon Kindle Fire, Sony Reader, BeBook, Bookeen Cybook Gen3 (with firmware v2 and up), COOL-ER, Adobe Digital Editions, Lexcycle Stanza, BookGlutton, AZARDI, FBReader, Aldiko, CoolReader, Mantano Reader, Moon+ Reader, the Mozilla Firefox add-on EPUBReader, Okular and other reading apps. eReader is a freeware program for viewing Palm Digital Media electronic books which use the pdb format used by many Palm applications. Versions are available for Android, BlackBerry, iOS, Palm OS (not webOS), Symbian, Windows Mobile Pocket PC/Smartphone, and OS X. The reader shows text one page at a time, as paper books do. eReader supports embedded hyperlinks and images. Additionally, the Stanza application for the iPhone and iPod touch can read both encrypted and unencrypted eReader files. On July 20, 2009, Barnes & Noble made an announcement implying that eReader would be the company's preferred format to deliver e-books. Exactly three months later, in a press release by Adobe, it was revealed Barnes & Noble would be joining forces with the software company to standardize the open EPUB and PDF eBook formats. Barnes & Noble e-books are now sold mostly in EPUB format. FictionBook is a popular XML-based e-book format, supported by free readers such as FBReader, Okular, CoolReader, Bebook and STDU Viewer. The .ibooks format is created with the free iBooks Author ebook layout software from Apple Inc.. This proprietary format is based on the EPUB standard, with some differences in the CSS tags used in an ibooks format file, thus making it incompatible with the EPUB open standard. The End-User Licensing Agreement (EULA) that comes with iBooks Author states that "If you want to charge a fee for a work that includes files in the .ibooks format generated using iBooks Author, you may only sell or distribute such work through Apple". The "through Apple" will typically be in the Apple iBooks store. The EULA further states that "This restriction does not apply to the content of such works when distributed in a form that does not include files in the .ibooks format." Therefore, Apple has not included distribution restrictions in the iBooks Author EULA for ibooks format ebooks created in iBooks Author that are made available for free, and it does not prevent authors from re-purposing the content in other ebook formats to be sold outside the iBookstore. This software currently supports import and export functionally for three formats. ibook, Plain text and PDF. It does not support importing or exporting in EPUB format. With the release of the Kindle Fire reader in late 2011, Amazon.com also released Kindle Format 8, their newest file format, also known as .AZW3. The .azw3 file format supports a subset of HTML5 and CSS3 features, with some additional nonstandard features; the new data is stored within a container which can also be used to store a Mobi content document, allowing limited backwards compatibility. The  sufficient for mobile phones with small screens, but rather restrictive for newer gadgets. Mobipocket Reader has electronic bookmarks, and a built-in dictionary. Commonly known as an Apple Newton book; a single Newton package file can contain multiple books (for example, the three books of a trilogy might be packaged together). All systems running the Newton operating system (the most common include the Newton MessagePads, eMates, Siemens Secretary Stations, Motorola Marcos, Digital Ocean Seahorses and Tarpons) have built-in support for viewing Newton books. The Newton package format was released to the public by Newton, Inc. prior to that company's absorption into Apple Computer. The format is thus arguably open and various people have written readers for it (writing a Newton book converter has even been assigned as a university-level class project). Newton books have no support for DRM or encryption. They do support internal links, potentially multiple tables of contents and indexes, embedded gray scale images, and even some scripting capability (for example, it's possible to make a book in which the reader can influence the outcome). Newton books utilize Unicode and are thus available in numerous languages. An individual Newton book may actually contain multiple views representing the same content in different ways (such as for different screen resolutions). Many products support creating and reading PDF files, such as Adobe Acrobat, iText and FOP. Third party viewers such as xpdf and Nitro PDF are also available. Mac OS X has built-in PDF support, both for creation as part of the printing system and for display using the built-in Preview application. The first e-books in history were in plain text (.txt) format, supplied for free by the Project Gutenberg community, but the format itself existed before the e-book era. The plain text format doesn't support digital rights management (DRM) or formatting options (such as different fonts, graphics or colors), but it has excellent portability as it is the simplest e-book encoding possible as a plain text file contains only ASCII or Unicode text (text files with Unicode or UTF-8 encoding are also popular for languages other than English). Almost all operating systems can read ASCII text files (e.g. Unix, Macintosh, Microsoft Windows, DOS and other systems) and newer operating systems support Unicode text files as well. The only potential for portability problems of ASCII text files is that operating systems differ in their preferred line ending convention and their interpretation of values outside the ASCII range (their character encoding). Conversion of files from one to another line-ending convention is easy with free software. DOS and Windows uses CRLF, Unix and Apple's OS X use LF, Mac OS up to and including OS 9 uses CR. By convention, lines are often broken to fit into 80 characters, a legacy of older terminals and consoles. Alternately, each paragraph may be a single line. The size in bytes of a text file is simply the number of characters, including spaces, and with a new line counting for 1 or 2. For example, the Bible, which is approximately 800,000 words, is about 4 MB. The TomeRaider e-book format is a proprietary format. There are versions of TomeRaider for Windows, Windows Mobile (aka Pocket PC), Palm, Symbian and iPhone. Several WorldHeritages are available as with all articles unabridged, some even with nearly all images. Capabilities of the TomeRaider3 e-book reader vary considerably per platform: the Windows and Windows Mobile editions support full HTML and CSS. The Palm edition supports limited HTML (e.g., no tables, no fonts), and CSS support is missing. For Symbian there is only the older TomeRaider2 format, which does not render images or offer category search facilities. Despite these differences any TomeRaider e-book can be browsed on all supported platforms. 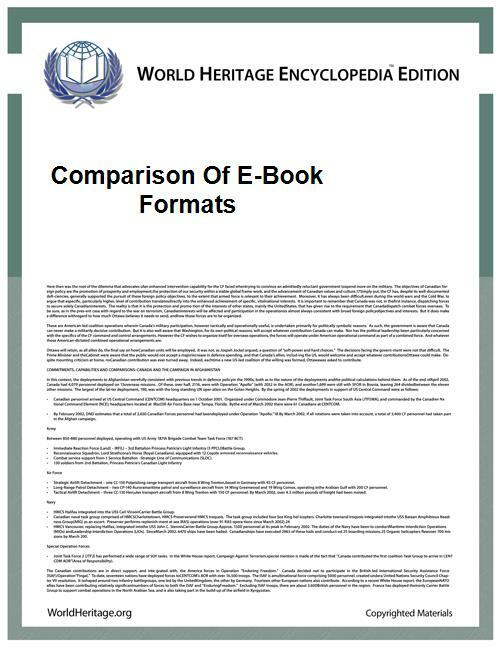 The Tomeraider website claims to have over 4000 e-books available, including free versions of the Internet Movie Database and WorldHeritage. DjVu .djvu ? Yes Yes No No No Yes Yes Yes ? DOC .doc ? Yes Yes ? ? Yes No ? ? ?